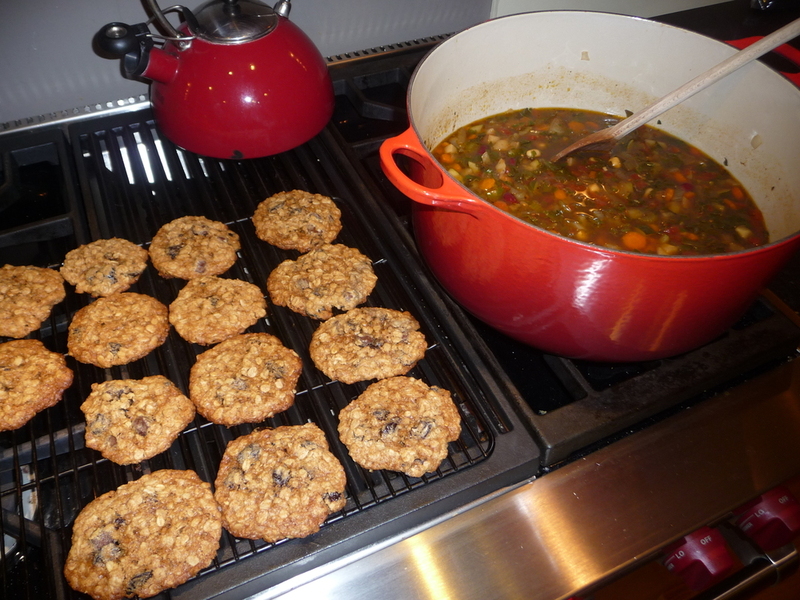 As I was making the Fretwell soup tonight, I felt compelled to make oatmeal raisin cookies. And as with brownies, Martha Stewart's recipe is the only one I need. Small change of plan, however: my raisins looked weird. Honestly I couldn't tell you how old they are but they looked really dried out and withered, congealed in a sticky, solid mass inside the container. Yuck. What else could I use? Ah, of course, my usual three and a half bags of Trader Joe's dried Montmorency cherries in the pantry. I love these things. I've always loved sour cherries: every year my Mom would pick, pit and freeze gallons of them to make pies. I would take a bowlful out of the freezer for a snack and eat them while reading. I consumed a lot of fruit and books in my youth, you can ask her about that sometime. Anyway, the dried variety at Trader Joe's was a spectacular discovery. Their sourness got me through being pregnant with Redman. They still help ward off carsickness on long trips and they are awesome with salted almonds while reading in bed. 1 1/2 cups raisins OR 1 cup dried cherries and 1/2 cup chocolate chips. Or any 1 1/2 cups of fruit-nut-chocolate combo as you see fit. In a medium bowl, whisk together oats, wheat germ, chia, flour, baking soda, baking powder, cinnamon and salt. Set aside. In mixer, cream butter and sugars until fluffy. Add eggs and mix. Add vanilla. Turn speed to low and add dry ingredients. Then add fruit and chocolate. Drop rounded teaspoons onto baking sheets. Bake 14 minutes, rotating trays halfway. Cookies will be brown on the edges but look slightly underdone on the tops. This is fine, they will collapse down and be lovely and chewy. Cool on wire racks. Get a big glass of milk and let 'er rip.